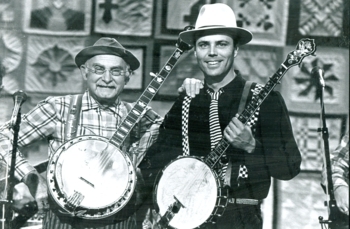 Grandpa Jones was very supportive and good to me. I will be forever grateful. He really liked the fact that I was a young fellow making a living playing old-time music. 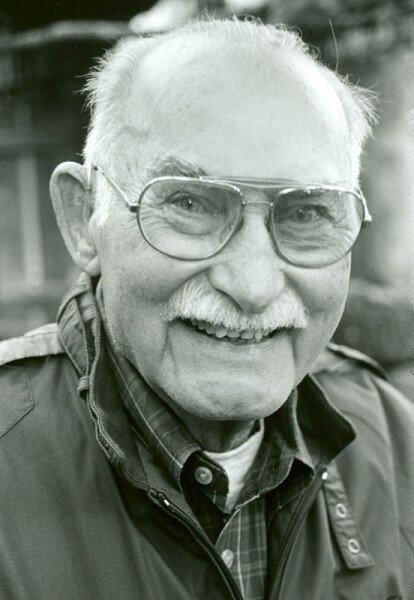 He had been making a living playing mountain music since the 1930s and knew it was swimming against the current. He called me and others the Flower of the Flock. Pa (as everybody called him) had a wicked sense of humor. He wasn’t a joke teller. His best jokes were ad libs, usually provoked by something that made him mad. He could be cranky and grouchy but those of us who knew him loved him more for it..cause he was always honest. Here are a few stories he told me and funny incidents I either witnessed or heard about. While working with Bradley in Maine they checked into hotel. Pa was young and had never really traveled much so when he went to bed he just pulled his pants off and hung then on chair and left door wide open. Bradley walked by the room and decided to teach Pa to be more careful. Bradley sneaked in and just took pants off the chair. When Pa awoke, he didn’t know what to do. He had no pants and worst of all, Pa had $7.50 in the pocket of those pants…all the money he had. Finally Bradley appeared, “How’d you sleep”. He listened to Pa straight faced and finally said, You are not home now, you can’t trust everybody, you must not only close doors but lock them too. Another lesson from Bradley Kincaid. On this occasion he was grouchy and fed up with folks yelling at him.